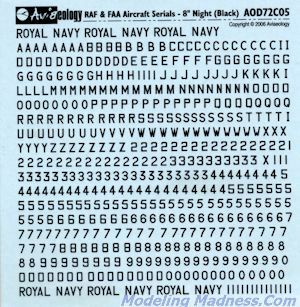 Aviaeology AOD72C05: RAF & FAA Serials: 8"
This sheet from Aviaeology is a set of 8 inch letters and numbers as used for serial numbers on RAF and FAA aircraft. These are applicable to both WWII and post war aircraft and are printed in black, the most widely used color. These are done in a variety of fonts so check your references as to which is applicable. I have found sheets like this to be quite helpful when modeling an aircraft for which no ready-to-go decal sheet has been produced. My thanks to www.aviaeology.com for the review sheet. You can get yours direct at this link.